Yosemite Falls is probably the biggest attraction of the same name, Yosemite National Park, located on the territory of California. 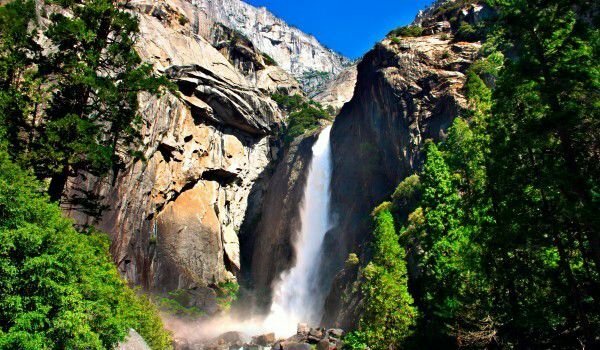 Yosemite waterfall carries the title of the highest in North America with its majestic and spectacular 700 m height of the water drop. This natural phenomenon is considered a symbol of grandeur and beauty of the national park. Furthermore leader for the continent, Yosemite Falls is one of the highest in the world and is also very easy to access. Thousands of tourists a year go into the national park to catch a glimpse and feel the indescribable power of this natural picture. It is best to visit Yosemite Falls in late spring when the water flow is at its peak. The exact height of this natural landmark is 739 meters, which automatically ranks it the sixth globally largest of the waterfalls. Some say that the waterfall is seventh as recent discoveries reveals waterfall, Gocta Cataracts, which has formed in the South American country of Peru and is measured up to 771 meters. The first part of Yosemite Falls is among the wild cliffs of 425 meters. On the basis of the far valley leading to the steep paths in full force can be detected the noise deafness and the beauty of the water masses. Routes there and from other parts of the national park are included in the UNESCO list of World Heritage. The second layer is a beautiful series of cascades falling from a height of 205 meters. This part of Yosemite Falls is clearly visible from the bottom, so often goes almost unnoticed because of its location. Many stunts are totally enclosed in the valley. In fact, there is a picture in magnitude of natural beauty and pageantry. The lowest bottom of the waterfall, Yosemite is its most popular picture of the whole phenomenon. There, the water falls from a height of 97 meters. Part of this water mass flows into the Merced River. There, visitors should be very careful especially because of the continuous water drops that have turned the whole region in to a slick field which makes it a potential hazard and an additional minus is the high humidity. 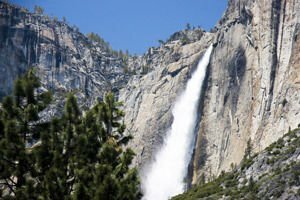 From the valley to the very top of Yosemite Falls there are organized excursions. The transition is in the daytime and is extremely heavy, so one will need a lot of enthusiasm, knowledge and desire. However, 6 km to the top of the grand and beautiful Yosemite gets pretty crowded, especially during peak tourist season.